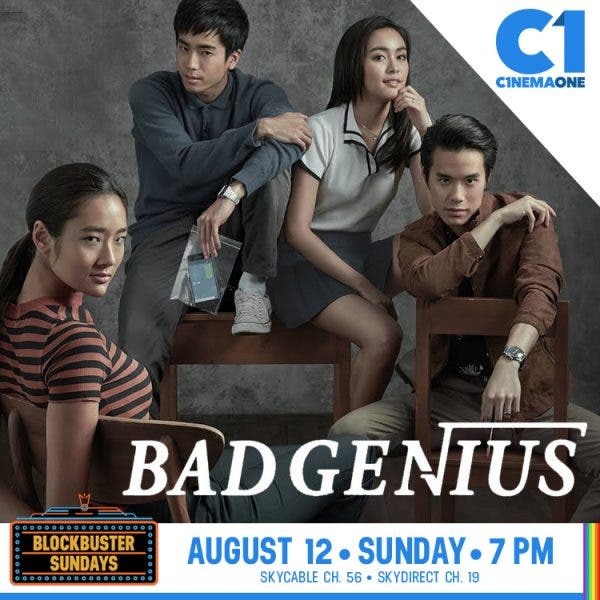 Thailand’s biggest global thriller to date, “Bad Genius,” an exhilarating high school exam delinquency-turned-international crime, makes its exciting movie premiere on Cinema One this Sunday (August 12). Chutimon Chuengcharoensukying stars as Lynn in “Bad Genius,” a straight-A high school student who engineers an exams-cheating scheme to earn money, a ruse that eventually involves loot worth millions of baht. Shot in Thailand and Australia, and based on real-life news of cheating in a college admission test, “Bad Genius” became the highest-grossing Thai movie last year and the most internationally successful Thai film to date. It also nabbed multiple awards in various international film festivals and won in twelve categories at the 27th Suphannahong National Film Awards. Maggie also commended the film’s stars. “The young cast burst with energy and have great comic timing. Teen model Chuengcharoensukying makes an eye-catching screen debut,” she wrote. Catch the exciting school crime adventure in “Bad Genius” on August 12, in Cinema One’s Blockbuster Sunday, now airing earlier at 7 PM. Cinema One is available on SKYcable Channel 56, SKYdirect Channel 19, Destiny Cable Analog 37 and Digital 56.